Noosa Food & Wine Festival 2017 has answered every food and wine lovers’ dream with an exciting program of events, which goes on sale on Friday 17th February. Seventy events will take place across the four-day event, which will run from 18th until 21st May. 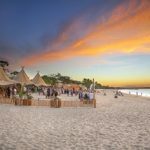 A total of 45 visiting chefs from Australia’s best restaurants will flock to this year’s festival, which will have a presence across two festival villages – Noosa Main Beach and The Woods. Noosa’s top restaurants will also enjoy local collaborations as they play host to a number of visiting chefs. With more than 50 wineries and 100 food producers taking part in this year’s festival, there really is something to suit every tastebud and budget – 13,000 tickets will go on sale across a range of events, with more than 40% of the tickets priced at less than $40. Festival Director, Maria Crews, says this year’s festival is shaping up to be the best one yet. “We are thrilled to announce our jam-packed program of events for this year’s festival, which showcases the breadth and depth of Australia’s best chefs, winemakers and producers. The festival is a mixture of fun, relaxation and pure enjoyment as well as good food and wine – all in one iconic destination, Noosa. A handful of signature events will be hosted across the four-day event, each one offering something completely different and special, for the ultimate food and wine experience. 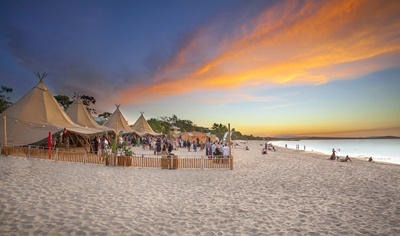 Located on Noosa Main Beach, the Beach Tipis will play host to the opening and closing cocktail parties, as well as a plethora of other events, including early morning yoga, brunch and lunch in the tipis. There will also be a pop-up Stokehouse on the Beach, with the teams from both Melbourne and Brisbane heading north to whip up a culinary dining experience under the stars. Sound of White presents The French Saloon on the beach will encompass the perfect evening of fine dining, with a fun and lively ambience. Ian Curley and his team will create a pop-up of their 1 hat restaurant in Melbourne, French Saloon. Dinner will be elegantly matched with wines from the Sound of White Vineyard in Marlborough, New Zealand. For a truly exclusive experience, make memories at Make Peace with Wine. A private island off the coast of Noosa, Makepeace Island is Richard Branson’s haven in Australia. Presented by The Drinks List and hosted by Matt Skinner, guests will be introduced to the world of wine and shown that everyone can enjoy drinking wine. Complemented with food by Matt Stone and Jo Barrett from Oakridge Estate Winery, this will be culinary paradise. Visit The Woods presented by Infiniti, which will be transformed into an expansive wine and produce village, home to more than 50 of Australia’s regions’ best wineries where tastings will be in abundance. The region’s best producers, cheese makers and saluministi will also be present, making sure no one goes home feeling hungry. End the day by chilling out in the Sticks Wine Bar and watch the sun go down over the Noosa river.